Pre-Grammar (Grades K-2) – Students are taught to read through a strong phonics program and are introduced to classic children’s literature. Mathematics instruction includes basic facts as the foundation on which students will build. Good behavior is encouraged as students learn from the heart what God expects of them. 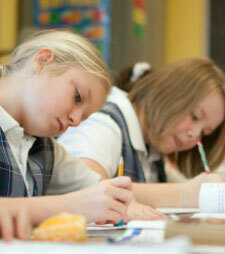 Grammar (Grades 3-6) – The child readily soaks up information and memorizes facts. In the grammar stage, students learn the who, what, when, and where of subjects as they learn multiplication facts in mathematics; land formations, capitals and countries in geography; names and dates of important events and people in history; and, vocabulary in English and Latin. Logic (Dialectic) (Grades 7-9) – At the stage when God has designed children to question things around them (i.e. “What’s the point of this?” or “So what?”), students are taught the skill of reasoning out the relationship between facts. They develop the skills to discern fact from fallacy and proof from propaganda. God’s Word is always used as the plumb line for determining truth and developing a Christian worldview. The learning of facts continues from the grammar years and analytical skill is developed in light of those facts. Rhetoric (Grades 10-12) – The craftsman is learning to master his tools at this stage. He begins to synthesize what he has learned, creatively express and make practical use of this knowledge. Mathematics might be applied in this stage to surveying or accounting. A student in the rhetoric stage in history might need to apply biblical facts to current events. The student is able to eloquently express his ideas and his knowledge both orally and in writing. He will draw from his knowledge of all subjects and will debate and defend his statements.